InventoryBuilder is a powerful, easy-to-use inventory manager designed to help you organize your valuables and important documents. In case your house is damaged or burglarized you can print reports to your insurance company for documentation of your items. You can also use it just to keep track off your TV's, cameras, computer hardware, DVD collection, artwork and every other valuable object in your home or office. 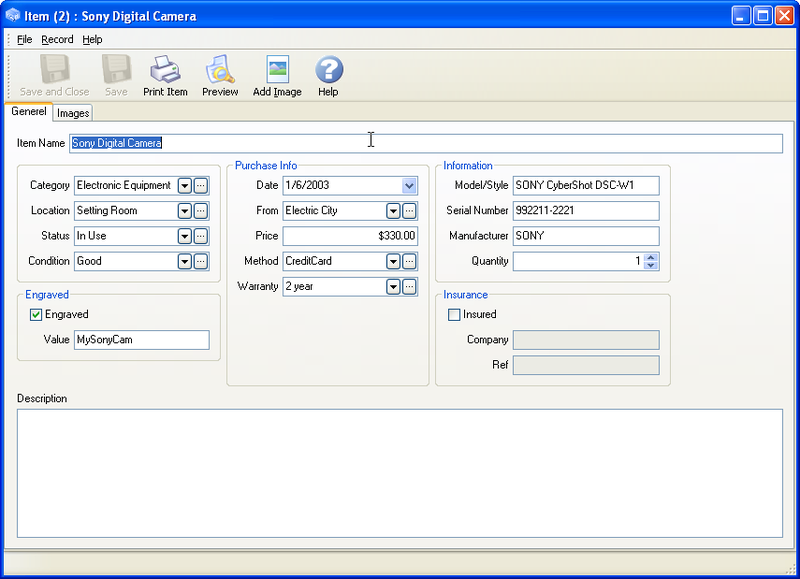 Store descriptive information for every item like condition, location, model, serial number and well anything else you can think of. You can store purchase information including where and when you bought it and how much you paid. Qweas is providing links to InventoryBuilder 3.0 as a courtesy, and makes no representations regarding InventoryBuilder or any other applications or any information related thereto. Any questions, complaints or claims regarding this application InventoryBuilder 3.0 must be directed to the appropriate software vendor. You may click the publisher link of InventoryBuilder on the top of this page to get more details about the vendor.